This evening I spotted this guy (or gal) resting on a branch of one of my orchids. When I first saw it I thought it was eating something. I brought in a couple of cuttings from the garden in late fall, and noticed a short while later that there were some aphids on the tomato. 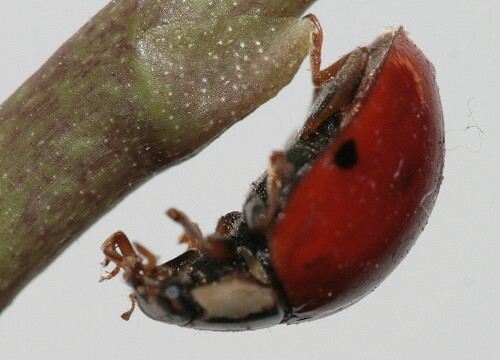 I collected up the ladybugs each time I spotted one in the house and placed it on the plant hoping they might help control the little plantsuckers. I suspect they were mostly interested in finding a place to hole up for the winter, and not so much in eating, but the aphids seem to be gone now so if the ladybugs didn’t eat them they must have died on their own. 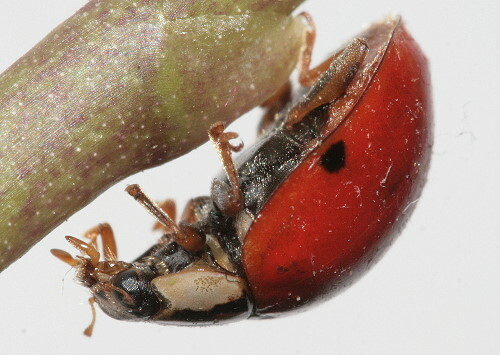 Although I thought it strange that the aphids had migrated to the orchid, both because I thought the aphids gone and the orchid’s flower scape is tough-skinned, not easy to bite through like the tomato plant, I nonetheless was relieved to see that the ladybug had found one and was doing the job it had been imported into North America for. Then I had to look closer. Was it really eating an aphid? 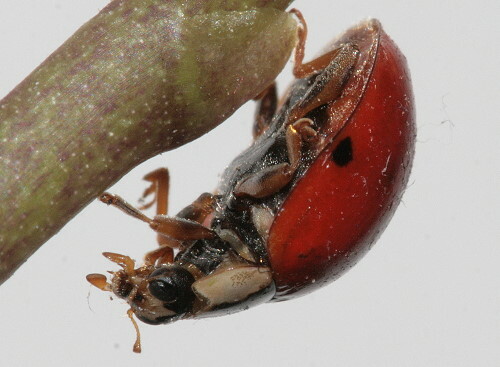 It seemed to be taking longer than I would expect an aphid to require, though I’ll admit I’ve never watched a ladybug eat an aphid before and for all I know they could take their sweet time savouring every bite. I was a bit puzzled. There seemed to be something sticking out from its mouth area, but it didn’t actually look altogether aphid-y. Finally it pulled its legs away and I realized the yellowish things I’d been looking at were the insect’s mouthparts. The movement I had been observing was the ladybug cleaning its legs, very fastidiously. Perhaps because at this time of year there isn’t a whole lot else to do, it had been taking its time about it, making sure every last speck of dust was removed and every hair was in place. It looked like it had some work to do on its elytra once it was done. 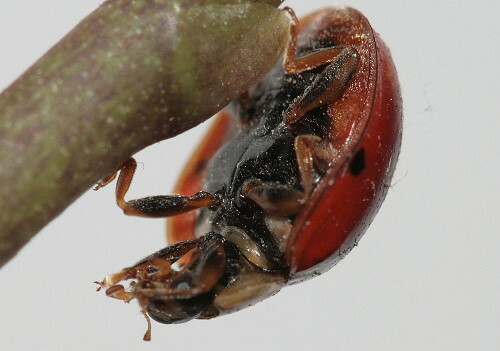 We don’t really tend to think of ladybugs as having a third body segment, but the white-and-black “head” that’s in front of the red wing covers is the pronotum, the middle segment of the insect’s three-segmented body. 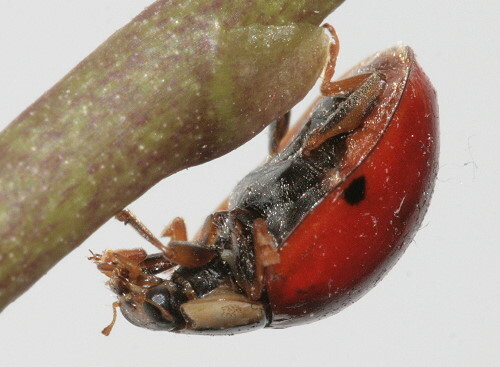 In front of that, and usually tucked underneath as the ladybug trundles along, is the head and eyes. The big yellow pads sticking out from its mouth are its maxillae, which it uses to manipulate food while eating it, a little like we use our tongue. For much of the time while I watched the ladybug dangled from the orchid scape, holding on by just one hind foot, equipped with a strong claw for just such a purpose. Look at the angle it’s held at. If I was dangling off something by just one limb, you can bet that limb would be straightened out and stretched to the max as I desperately tried not to let go. It’s amazing how strong these bugs are. Excellent macro photography. Our recent string of warm fall days has really brought out the Asian Ladybugs. Thanks, Marvin. We’ve seen a few of them about here just recently. This morning when I put on my glasses I thought I must have them crooked because I was noticing the arm more than usual. Then when I entered the washroom I thought it strange that it smelled so strongly of ladybugs. It took me a few moments to realize that there was one on the arm of my glasses and I hadn’t noticed it when I put them on. They can get everywhere when they’re really out and about. What a beautiful little creature! I learn something new every time I visit your Marvelous blog. Thanks! Thanks, Sarah! I’m glad you enjoy your visits! what fantastic macros Seabrooke! incredible detail. cool look at the maxillae. I’m way behind on my visits here, will have to catch up with all of the marvelous natural history you always share. Thanks, Cindy. I completely understand – I’m perpetually behind on all my blog reading, there’re so many good ones out there, and so little time to read them! Great photos! But they look a lot cuter from the top. It’s true; they look a lot more insect-like close up. 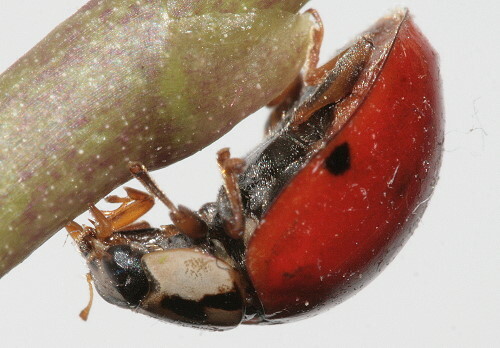 that is THE coolest ladybug documentary ive ever read! too bad you didnt get the bug eating the aphid. that would have been one great shot! Glad you liked it, Miss Pegasus! I’ll have to try for the aphid shot next time I’m having aphid troubles. Great photos! I love that it was holding on with one leg, one foot. It looks so effortless. I’m with you: I’d be scrambling with every limb I have trying to find a good grip. I’ll add I’ve been there before with watching an insect clean a body part while I wondered if it was eating something. Then again, I’ve also watched them eat something while I thought they were bathing. It would be much easier if my eyes had built-in zoom. Thanks, Ken. Yes, insects are definitely designed to be able to hang upside down by one limb, and we’re not. The same as birds being able to fly, I suppose, something else I would love to be able to do. It’s all in the physics. Also in the limb movement, for flying, which I don’t know that we have the joints to accomplish, even if we fitted our arms with large enough airfoils to lift our substantial weight.